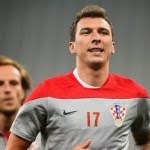 ARSENAL AFTER MARIO MANDZUKIC ? Bayern Munich striker Mario Mandzukic has admitted that he has no future at the club under Pep Guardiola. The Croatia international striker admits he became convinced his days at Bayern were numbered after the first game of last season. “No matter how hard I tried, in this type of football I cannot give my best,” he said of Guardiola’s tiki-taka style. “After the first game at Bayern, I knew this. Chelsea, Arsenal and Juventus all head the queue of clubs chasing Mandzukic’s signature this summer.